When Associate Professor Megan Munsie began her Bachelor of Applied Science at QUT in the mid-1980s, female academic role models were rare. “I had moved away from home to study, I was the first person in my family to go to university, and I had one female lecturer, Pam Stallybrass,” recalls the Deputy Director of the Centre for Stem Cell Systems at the School of Biomedical Sciences, University of Melbourne. Finding a mentor who can see your potential and support your career in biomedicine is essential, says Associate Professor Munsie. Later, during her Masters in Reproductive Sciences at Monash University, it was Professor Kath Loveland, who helped Associate Professor Munsie overcome her self-confessed “imposter syndrome”. “At that time I felt apprehensive undertaking my own research project as I had only worked in clinical labs since completing my undergrad degree,” she recalls. Two decades later, the Head of Engagement, Ethics & Policy Program at Stem Cells Australia, says she is happy to be surrounded by women in senior science roles. It has also been the backing of male industry leaders that helped Associate Professor Munsie make significant breakthroughs in her research. With support from her PhD supervisor Dr Peter Mountford and encouragement from institute head Professor David de Kretser, Associate Professor Munsie became the first person to demonstrate that stem cells could be made from ‘cloned’ mouse embryos in 2000. As well as advancing her medical research career, Associate Professor Munsie spent 10 years working as an embryologist in Australian IVF clinics. As a result, she faced many challenges, particularly when it came to public perception about her area of science. “Back in the 1980s, IVF was very controversial. It raised the question of when does life begin? And has technology gone too far? I always saw an embryo as having a potential to be alive, but a life not yet realised,” she says. It’s been this passion for innovative public engagement and the development of ethical policy and professional standards associated with stem cell research – and its clinical translation – that has fuelled her career in recent years. Associate Professor Munsie is now a member of several international research teams exploring the impact of stem cell research and regularly provides advice to Australian patient advocacy groups and community members. As a result, in 2018, she was awarded the Public Service Award from the International Society for Stem Cell Research in recognition of her public outreach and policy advocacy in stem cell science. 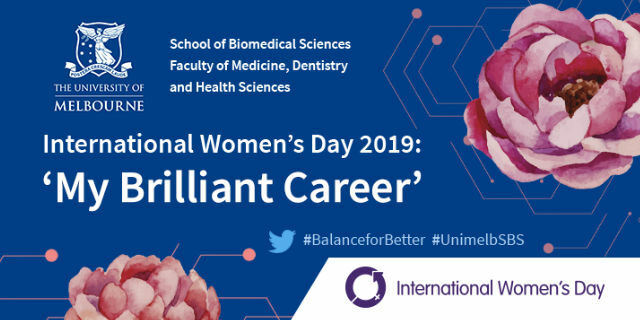 When it comes to Balance for Better, the theme of this year’s International Women’s Day, in which Associate Professor Munsie is moderating The University of Melbourne’s ‘My Brilliant Career’ event, she says respecting a diversity of opinions in science is key. 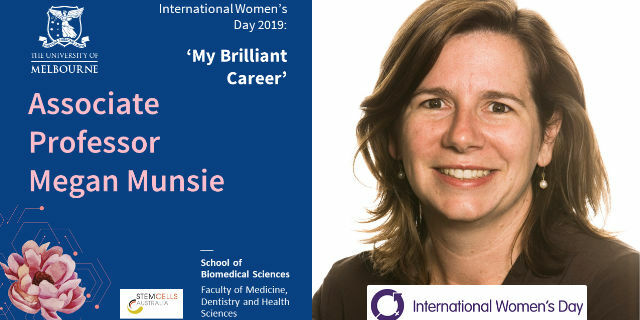 Hear more from Associate Professor Munsie and the panel of leading women in biomedicine in the International Women’s Day: My Brilliant Career podcast. Available from Friday afternoon, 8 March.